Chinese Cambodians also play a leading role in Cambodia's business sector and dominate the Cambodian economy today. In addition, Chinese Cambodians have a strong presence in Cambodia's political scene with many high ranking government officials and much of the political elite being of partial Chinese descent. The earliest records of Chinese settlement dates back to the late 13th century. Yuan emissary Zhou Daguan visited Cambodia in 1296 and authored his detailed and comprehensive Record of Cambodia in which he mentions the presence of Chinese residents at Angkor. Portuguese seafarers noted the presence of a Chinese settlement in Phnom Penh in the early 17th century. Around the same time Lim To Khieng, a Chinese privateer made similar observation during his stay in Cambodia while trading and conducting sea raids. Shortly after the fall of the Ming dynasty in 1644, Chinese troops under the command of Mac Cuu and Duong Ngan Dich encouraged large numbers of refugees from Fujian and Guangdong provinces to settle in Indochina. The majority of the immigrants were men who eventually married local Khmer women. Their descendants usually assimilated smoothly into the local communities, the economic and social process and personally identified as Cambodians. However, customs were also imported, such as the practice of the Chinese topknot that was practized until the 18th century. The French first introduced a legislation in 1873 which classified Chinese immigrants as 'Alien Asians' and subjects were subjected to resident taxes. King Norodom introduced a legislative reform in 1884 which required the Chinese immigrants to pay higher resident taxes but there were no legal restrictions imposed for immigrants to take up Cambodian citizenship. In 1891, the French introduced a legislation first introduced by Gia Long in Cochinchina, called "bang" in Chinese. Five associations were established in Cambodia, each identified by their specific region of ancestral origin in China; Cantonese, Hokkien, Hainanese, Teochew and Hakka. Chinese immigrants were required to register with their association to settle in Cambodia. Each of these associations were led by an elected headman, who would be responsible for maintaining law, order and tax collection duties from their countrymen. The French system of administering the Chinese Cambodian community was terminated in 1958. During the 1960s, Chinese community affairs tended to be handled, at least in Phnom Penh, by the Chinese Hospital Committee, an organization set up to fund and to administer a hospital established earlier for the Chinese community. This committee was the largest association of Chinese merchants in the country, and it was required by the organization's constitution to include on its fifteen-member board six people from the Teochew group, three from the Cantonese, two from the Hokkien, two from the Hakka, and two from the Hainanese. The hospital board constituted the recognized leadership of Phnom Penh's Chinese community. Local Chinese school boards in the smaller cities and towns often served a similar function. In 1971 the government authorized the formation of a new body, the Federated Association of Chinese of Cambodia, which was the first organization to embrace all of Cambodia's resident Chinese. According to its statutes, the federation was designed to "aid Chinese nationals in the social, cultural, public health, and medical fields," to administer the property owned jointly by the Chinese community in Phnom Penh and elsewhere, and to promote friendly relations between Cambodians and Chinese. With leadership that could be expected to include the recognized leaders of the national Chinese community, the federation was believed likely to continue the trend, evident since the early 1960s, to transcend dialect group allegiance in many aspects of its social, political, and economic programs. Generally, relations between the Chinese and the ethnic Khmer were good. There was some intermarriage, and a sizable proportion of the population in Cambodia was part Sino-Khmer, who were assimilated easily into either the Chinese or the Khmer community. Willmott assumes that a Sino-Khmer elite dominated commerce in Cambodia from the time of independence well into the era of the Khmer Republic. The Khmer Rouge takeover was catastrophic for the Chinese community for several reasons. When the Khmer Rouge took over a town, they immediately disrupted the local market. According to Willmott, this disruption virtually eliminated retail trade "and the traders (almost all Chinese) became indistinguishable from the unpropertied urban classes." The Chinese, in addition to having their livelihood eradicated on the whole, also suffered because of their socioeconomic class. They were mainly well-educated urban merchants, and thus were characteristic of the people whom the Khmer Rouge detested. Chinese refugees have reported that they shared the same brutal treatment as other urban Cambodians under the Khmer Rouge régime but they were not discriminated against as an ethnic group until after the Vietnamese invasion due to the PRC's support of the Khmer Rouge. Several of the most senior members of the Khmer Rouge were themselves of partial Chinese descent, such as Nuon Chea, Ieng Sary, Khieu Samphan, Kang Kek Iew, Son Sen, Ta Mok and even Pol Pot himself. King Sihanouk saw the delineation and repression of Chinese business and identity as nationalism emerged and the Chinese were perceived as threatening to Cambodian sovereignty. During the various regimes between 1970 and 1990, Chinese enterprise and cultural expression was completely banned and destroyed and many ethnic Chinese died or fled the country. Following the Vietnamese invasion of Cambodia and the fall of Democratic Kampuchea, the new pro-Hanoi People's Republic of Kampuchea regime lifted some of the oppressive rules imposed on ethnic Chinese by the Khmer Rouge government. Chinese newspapers were allowed and the ban on speaking Chinese at home was lifted. However, partial restrictions and a certain amount of suspicion remained, for the pro-Soviet PRK regime resented China's support for the Khmer Rouge guerrillas fighting against it, now renamed as the "National Army of Democratic Kampuchea" (NADK). Observers at the time believed that the lingering anti-Chinese stance of the PRK government and of its officials in Phnom Penh made it unlikely that a Chinese community of the same scale as before the Khmer Rouge could resurface in Cambodia in the near future. The conditions for the ethnic Chinese, however, improved greatly under the SOC, the transitional avatar of the PRK after 1989. Restrictions placed on them by the former PRK gradually disappeared. The State of Cambodia allowed ethnic Chinese to observe their particular religious customs and Chinese language schools were reopened. In 1991, two years after the SOC's foundation, the Chinese New Year was officially celebrated in Cambodia for the first time since 1975. Of particular note is China's economic role in the country, which encouraged Sino-Khmer businessmen to reestablish their past business which were once suppressed by the Khmer Rouge. Modern Cambodian economy is highly dependent on Sino-Khmer companies who controlled a large stake in the country's economy,and their support is enhanced by the large presence of lawmakers who are of at least part-Chinese ancestry themselves. The Chinese language study is increasing in Phnom Penh, with the subject recently added to the national curriculum at the university level. Many Cambodians of ethnic Chinese descent learn Chinese for employment as well as business reasons due to the fact as many Mainland Chinese investors are investing across the Cambodian economy. The position of the Chinese minority has undergone a dramatic turn for the better and the Chinese seem to have regained much of their previous economic clout. For various reasons, including the growing economic collaboration between China and Cambodia and the huge investments being made by Chinese companies, the Chinese community has seen its numbers expand dramatically in the 2000s (decade). There has been a huge growth in Chinese-language schools, often generously supported by the government of China through subsidies, and also in the production of textbooks (in Chinese) that incorporate Cambodian history and seminars for teachers. There may be close to 100 such schools today (2007). One of these private schools claims to be the largest overseas Chinese school in the world, with some 10,000 students. A number of Chinese-language newspapers began to be published in the country after 1993, and state television broadcasting even included a news segment in Chinese after 1998. All of the main political parties in Cambodia now appear sensitive to the clout of the Chinese minority, publishing campaign material in Chinese in the last elections. While this minority faced serious discrimination until the 1980s, it appears that that period has come to an end and that they no longer appear to be victimized by state authorities and are allowed to prosper under Hun Sen. According to statistics from the Ministry of Planning by the Cambodian government, approximately 15,000 individuals, or 0.1% out of the country's total population of 15 million were identified as ethnic Chinese in 2013. A year later, Chinese associations in Phnom Penh estimates that around 700,000 Cambodians have at least some Chinese ancestry. A government census done in 1962 showed that 163,000 individuals Cambodian nationals were registered as Chinese, which amounted to as much as 3% of the country's population. The ECCC had noted that then-Prince Sihanouk had estimated the Chinese population in Cambodia made up of 300,000 to 435,000 individuals in 1965, while CIA had estimated that there were about 444,000 Chinese in 1975. A University field study conducted by William Willmott in 1961 found that there were 425,000 Chinese in Cambodia, which made up to approximately 7.4% of the total population at that time. Willmott noted that there is a tendency for some Chinese who have taken up Cambodian citizenship, or Chinese descendants who have assimilated into Khmer society through intermarriages to be identified as Khmer in government censuses. During the late 1960s and early 1970s the approximately 425,000 Chinese Cambodians represented the largest ethnic minority in Cambodia. However, this number had fallen to a mere 61,400 by 1984. This rapid decline has been attributed to the accumulation of causes like warfare, economic stagnation, the Khmer Rouge era and subsequent emigration. Official censuses between 2004 and 2008 recorded that Chinese consisted of 0.3% of the country's total urban population and are concentrated mostly in Phnom Penh, while Chinese fluctuated between 0.0% and 0.1% of the country's total rural population between 2004 and 2013. Willmott's study of Chinese in Cambodia's urban and rural areas in 1963 recorded that 59% of the Chinese lived in cities and towns while 41% lived in the countryside. Phnom Penh had a Chinese population of 135,000, or about one-third (33.5%) the city's total population. The Teochew people make up the largest Chinese sub-group in Cambodia and make up about 77% of the Chinese population. About 85% of the Teochews in Cambodia came from the prefectures of Jieyang and Shantou of Guangdong province in China. The earliest records of Teochew immigrants dates back to the 16th century when some mutineers under the leadership of the Chinese pirate, Lim To Khieng settled in Cambodia. No significant of Chinese immigration from the Chaoshan region occurred until the 1860s, and the Teochews came to Cambodia in modest numbers in the later part of the 19th century. Large-scale immigration occurred in the 1920s and 1930s, and the Teochews established themselves as the dominant Chinese sub-group thereafter. Approximately 48% of the Teochews live in rural area, and they made up about 90% of the rural Chinese population. The Teochews is also the largest sub-group in Cambodia, where some 100,000 out of 135,000 Chinese in 1962 are from this sub-group. Teochews in rural region of the country generally make their living as village shopkeepers, rural credit moneylenders, rice merchants or as vegetable farmers. In Phnom Penh and the smaller towns, the Teochews are generally import-export Entrepot traders, pharmacists or street peddlars. The Cantonese are also known as "Chen-Catung" in Khmer language. They made up the largest Chinese sub-group in Cambodia between the 17th century until the early 20th century. lived mainly in the city. About 40% of the Cantonese are concentrated in Phnom Penh, while most of the remainder are found in Battambang, Kampong Cham, Kampong Chhnang and Kratie where they make up at least 30% of the Chinese populace. About 55% of the Cantonese came from the prefectures of Dongguan, Guangzhou and Foshan in Guangdong. In the 1880s and 1890s, Chinese real estate developers of Cantonese origin secured building contracts from the French colonial government, to develop brick-and-concrete shophouses in a programme of urban renewal of modernizing Phnom Penh. The Cantonese, who comprised the majority of Chinese Cambodians before the Teochew migrations began in the late 1930s, lived mainly in the city. Typically, the Cantonese engaged in transportation and in the skilled construction trades mainly as mechanics or carpenters. More than 80 percent of the Hainanese people traced their origins from Wenchang county. People from Hainan settled in Cambodia from the early 18th century under Mạc Cửu, who established a trading settlement that spanned modern-day Ha Tien, Kampot province and Sihanoukville. Early Hainanese settlers started off as entrepot traders but turned to pepper trading at the end of the 18th century. They established pepper plantations in Kampot, and became the dominant Chinese sub-group in that province. Smaller Hainanese communities are also found at Sisophon and Sre Ambel. In the 1950s, many Hainanese would then move to Phnom Penh, where, in the late 1960s, they monopolized the city's entire hotel and restaurant business. Hainanese of more humbler socioeconomic backgrounds operated tailor shops and haberdasheries. The Hokkien sub-group were believed to be the earliest Chinese sub-group to settle in Cambodia. Most of the Hokkiens trace their ancestry back to Quanzhou and Xiamen prefectures in southern Fujian province. The Hokkiens settle mainly in Phnom Penh and Battambang, and many Khmer families in Battambang claimed to have some distant Hokkien Chinese ancestry. The Hokkien community is involved the import-export shipping trade and in banking. They also comprised a large percentage of the country's richest Chinese. About 65% of the Hakka trace their roots back to Meizhou and Heyuan prefectures in Guangdong province. About 70% of the Hakkas are found in Phnom Penh where they are dominant professions in the field of Traditional Chinese Medicine, and shoemaking. Hakkas are also found in Takeo province, Stung Treng and Rattanakiri who consist of vegetable farmers and rubber plantation workers. Hakka communities in the provinces migrated to Cambodia through Tonkin and Cochinchina in the 18th and 19th centuries. In Phnom Penh, the newly-arrived Hakka were typically folk dentists, sellers of traditional Chinese medicines, and shoemakers. Many Chinese Cambodian families have their children learn Chinese to reaffirm their Chinese identity as Mandarin has been increasingly the primary language of business for Overseas Chinese business communities. One main factor is due to the rise of China's global economic prominence and many Chinese Cambodian business families see Mandarin as a beneficial asset to partake economic links to conduct business between Cambodia and Mainland China. Chinese Cambodians are generally practitioners of Chinese folk religion, which incorporates rituals associated with Taoism, Confucianism and Buddhism. Most Chinese families maintain a small shrine dedicated to at least one or more legendary or historical figure, and popular choices include Kitchen God, Guan Yu, Guan Yin, Matsu and Wang Ye. During festive occasions such as Chinese New Year, Chinese Cambodians would pray at communal temples either individually or as a group. Joss sticks and paper as well as food offerings are used for prayers. On certain occasions such as funerals or fortune-telling, Chinese Cambodians would approach spirit mediums and geomancers. A small minority of Chinese Cambodians follow mainstream Mahayana Buddhism of the Chan denomination. Chinese Cambodian families generally do not practice Theravada Buddhism and send their children to Khmer monasteries, except for those descendants who have assimilated into mainstream Khmer society. In the 1990s and 2000s, there exists a trend among assimilated Sino-Khmer silk merchants who maintain commercial links with Chinese businessmen to re-adopt Chinese cultural and religious practices. They maintain Chinese shrines in their homes and shops, and explained that the adoption of such practices are necessary to forge closer ties with Mainland and Overseas Chinese businessmen. Phnom-Penh continues to be Cambodia's major financial district and business networking hub for Chinese Cambodian businessmen. The city is now teeming with thousands of prospering Chinese businesses with the Phnom Penh Chinese community controlling most of the city's retail enterprises. Like much of Southeast Asia, ethnic Chinese dominate Cambodian commerce at every level of society. Entrepreneurial savvy Chinese have literally taken over Cambodia's entire economy. Ethnic Chinese wield tremendous economic clout over their indigenous Khmer majority counterparts and play a critical role in maintaining the country's economic vitality and prosperity. The ethnic Chinese community is one of the most socioeconomically and politically influential and powerful communities in Cambodia. The community dominates the entire Cambodian business sector and is economically prosperous relative to their indigenous Khmer counterparts. With their powerful economic prominence, the Chinese virtually make up the country's entire wealthy elite. Within this structure, Cambodia as a plural society where one’s place in the economic structure depends on one’s ethnic background. Furthermore, the Chinese Cambodians “not only form a distinct ethnic community, they also form, by and large, an economic class: the commercial middle and upper class in contrast to the poorer indigenous Khmer majority working and underclass, who have traditionally looked down on commerce. Chinese economic dominance of Cambodia dates back the pre-French colonial kingdoms where Chinese merchants often maintained patron-client relationships with the Khmer monarchy. William Willmot, a Sinologist at the University of British Columbia estimates that 90 percent of the Chinese in Cambodia were involved in commerce in 1963. Playing a crucial economic role in the country, the Chinese control almost all of Cambodia's internal trade and substantial portion of the manufacturing including rice-milling and transportation sectors. Today, an estimated 60 percent are urban dwellers engage in commerce while the rest of the rural population work as shopkeepers, processors of food products (such as rice, palm sugar, fruit, and fish), and moneylenders. Throughout Cambodian cities, Chinese dominated numerous industries such as retail, hospitality, export-import trade, light, food processing, soft drinks, printing and machine shops. In addition, virtually all of Cambodia's richest people are of Chinese descent. Rural Chinese businessmen operated general shops that provided ethnic Khmer peasants with essential purchases such as farming supplies, groceries imported from China, sanpots and sarongs, bamboo baskets, perfume, kerosene for lamps, alcohol as well as tobacco. Those in the Kampot Province and parts of Kaoh Kong Province cultivate black pepper and fruit (especially rambutans, durians, and coconuts). Additionally, rural Chinese Cambodians also engaged in salt water fishing. In the 19th century, French colonials allowed Chinese-run businesses to flourish due to their laissez faire capitalist policies. Willmott estimated that the ethnic Chinese controlled 92 percent of the Cambodian economy by the mid-20th century. They traded in urban areas and worked as shopkeepers, moneylenders and traditional healers in rural areas, while Chinese farmers controlled Cambodia’s lucrative Kampot pepper industry. Chinese Cambodian moneylenders wield considerable economic power over the poorer indigenous ethnic Khmer peasants through usury at an interest rate of 10 to 20 percent per month. This might have been the reason why seventy-five percent of the peasants in Cambodia were in debt in 1952, according to the Australian Colonial Credit Office. Chinese Cambodian entrepreneurs are also estimated to control 70 percent of the industrial investment and are actively engaged in trading, real estate development, construction, small-scale manufacturing, alcohol distilling, hospitality, fast food restaurants, and food processing. Ethnic Chinese also dominate the silk weaving industry where key commercial positions in the Cambodian silk trading networks are completely held in Chinese hands. ACLEDA Bank, the largest domestic Cambodian commercial bank in terms of total assets and clients. Ethnic Chinese control all five major banks in Phnom-Penh. Cambodia's rice milling industry is completely under Chinese hands and wield a complete monopoly on rice distilling. At the turn of the 20th century, Cambodia's rice mills was completely controlled by the Chinese and was responsible for the nation's entire export of rice. Hierarchies of rice mills were established ranging from the small humble rural rice dealer all the way to the colossal Cholon style rice mills. Many shopkeepers also mixed and diversified other services of value such as lending money and retailing manufactured goods in addition to rice trading. Despite constituting less than 1 percent of the overall population of Cambodia, ethnic Chinese are estimated to control 70 percent of the publicly listed companies on the Cambodian stock exchange. Of the 346 shipping firms listed in the 1963 issue of the Chinese Commercial Annual, a minimum of 267 or 78 percent were owned by Chinese Cambodians with the eight of the top ten businesses being owned by Sino-Khmers. The remainder were either French or state owned but economic preponderance prompted ethnic Chinese businessmen to act as financial intermediaries operating as agents for the French as well as their own. In addition, Chinese investment in Cambodia was second to the French prior to the Second Sino-Japanese war. 95 percent of the internal trade was also under control of the Chinese. Of the 3349 industrial firms listed by the Cambodian Ministry of Industry in 1961, 3300 or 99 percent were controlled by the Chinese with the rest being either state owned or by French interests. Chinese representation of the 3300 strong firms was 90 percent of the total private investment in the aggregate. Industrial firms range from artisan work shops, small scale manufacturing, foodstuff (dry ice, soda pop, or soy sauce) and primary processing of saw milling, rice milling, sugar refining and charcoal burning. Since 1995, Chinese Cambodians have reestablished themselves as the dominant economic players since the fall of the Khmer Rouge by controlling Cambodia's entire import-export shipping, banking, hotel, gold and rice trading, garments, industrial manufacturing and real estate sectors. Market reforms during the mid-1980s have attracted a large contingent of wealthy Overseas Chinese entrepreneurs looking to exploit opportunities in Cambodian property development and general trading. Ethnic Chinese are responsible for pioneering the development of the country's entire small, medium, and large enterprise sector by setting up trading and production firms, restaurants, and stores, as well as establishing virtually all of the country's politically well-connected business groups. Utilizing the bamboo network business model, ethnic Chinese businesses are structured as family businesses, trust-based networks, and patronage arrangements with a centralized bureaucracy. Moreover, social mechanisms that underpin these entrepreneurial trajectories largely derive from family, ethnic, cultural, and patron-client ties based on personalized and informal trust. Confucian Chinese business practices and societal discourses that link “Chineseness” are stereo-typically linked to economic success which is omnipresent in contemporary Cambodia. Ethnic Chinese entrepreneurs continue to remain the driving force behind the modern Cambodian economy with many of them having relatives in government through political connections and business networks in the Cambodia Chamber of Commerce, which is predominantly made up of ethnic Chinese themselves. Entrepreneurial networks, Chinese family clan associations, Chambers of Commerce with business resources are found across the country to assist aspiring Chinese Cambodian entrepreneurs. Furthermore, the opening up of China's global prominence in the world economy has induced the resurrection of ties between the ethnic Chinese in Cambodia and their ancestral homeland in Mainland China. Hun Sen’s pragmatic, capitalist-oriented vision of rebuilding Cambodia has been an impetus for attracting an influx of foreign capital investment, particularly from Mainland China. Today, Cambodia's ethnic Chinese are now at the forefront of opening up the country's economy as an international Overseas Chinese economic outpost. Much of the foreign investment now entering Cambodia is being channeled through Overseas Chinese bamboo networks. Many members of the Chinese Cambodian business community often act as agents for expatriate Mainland and Overseas Chinese investors outside of Cambodia. Of particular note is Mainland China's economic role in the country, which has emerged to become a dominant foreign player in Cambodia. China's source of external influence in the Cambodian economy has encouraged Chinese Cambodian businessmen to reestablish their past businesses and regain their lost property which were once confiscated by the Khmer Rouge. The modern Cambodian business sector is highly dependent on ethnic Chinese companies who control virtually the country's entire economy and their support is enhanced by the large presence of lawmakers and politicians whom are of at least part-Chinese themselves. Cambodia’s lack of an indigenous Khmer commercial culture in the private sector that is dominated entirely by Chinese Cambodians, has encouraged a plethora of Mainland Chinese foreign investment capital into the country. From 1994 to July 2011, Mainland China invested more than $8.8 billion USD across the country. The Cambodian government has made efforts to attract hundreds of millions of dollars in investments from Mainland China and Overseas Chinese businessmen as well as marketing the nations tourism industry to potential Mainland Chinese clients. In addition, Mainland Chinese expatriate entrepreneurs and investors have been coming to Cambodia to acquire Cambodian assets and have invested substantial amounts of capital across the Cambodian economy channeling their financial capital through bamboo networks. The Cambodian Chinese business community has been backed by the Cambodian political elite as much of the country depends on ethnic Chinese entrepreneurs and the pouring of Mainland Chinese investment capital for job creation has added to the globalized value added investment chain in the country. The CPP itself has incorporated many ethnic Chinese who provide financial support to the party with many high government officials and other major political decision makers being of partial Chinese descent. The position of the Chinese minority has undergone a dramatic turn for the better and the Chinese seem to have regained much of their previous economic clout. The influx of Chinese capital has led to a resurgence of Chinese cultural pride among the Chinese Cambodian community while concurrently creating new jobs and economic niches. Following the transition of Cambodia from socialism to market-driven state owned capitalist principles, that Cambodia’s Chinese community began to reassert their cultural identity and economic clout. This reassertion of Chinese identity has blossomed into confident displays of Han Chinese ethnic pride following the influx of Mainland Chinese investment into Cambodia. Since 1990, Cambodia witnessed a rebirth of Han Chinese cultural expression and business boom across the country. Regional trade networks were restored and small and medium sized businesses have flourished since the introduction of market-driven state owned capitalist principles in the country. The growing economic collaboration between China and Cambodia and the huge investments being made by Overseas and Mainland Chinese companies in the country has led the Chinese Cambodian community to see its numbers expand dramatically since the turn of the 21st century. The 21st-century Chinese Cambodian community remains a modern well established commercial middle and upper class group. The community remains an insular and tight-knit group that has integrated well into local Cambodian society becoming a stereotypical trope representing socioeconomic success and extreme wealth. As ethnic Chinese economic might grew, Cambodian hill tribes and aborigines were gradually driven out into poorer land on the hills, on the rural outskirts of major Cambodian cities or into the mountains. The increased resurgence of Chinese cultural and economic activity in 21st-century Cambodia has triggered distrust, resentment and Anti-Chinese sentiment among the poorer indigenous Khmer majority, many whom eke out a simple living engaging in rural agrarian rice peasantry or fishing in a stark socioeconomic contrast to their modern, wealthier, and cosmopolitan middle class Chinese counterparts, who mainly engage in business, the skilled trades, or white collar professional occupations. Kang Kek Iew - Mathematics professor and chief of Tuol Sleng Prison. Nuon Chea (劉平坤) - Khmer Rouge ideologist. Pol Pot - Cambodian politician and revolutionary who served as the Prime Minister of Democratic Kampuchea from 1976 to 1979. Ta Mok - senior Khmer Rouge figure and former leader of the national army of Democratic Kampuchea. Lon Nol - President of the Khmer Republic (Chinese-Khmer extract). Bun Rany - The Head of Cambodian Red Cross, First lady, and the wife of the Cambodian prime minister, Hun Sen.
Sinn Sisamouth - The "King of Khmer Music". He was of mixed race descent (native Cambodian, Cambodian Chinese and Laotian). Cham Prasidh - The Cambodian Minister of Industry, Mines & Energy (Chinese descent). His original Chinese name is pronounced as Aik Tik Yu. Tea Banh - Cambodian People's Party politician and Minister of National Defence (Thai-Chinese). 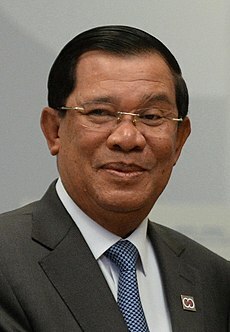 Hun Sen - The 34th and current Prime Minister of Cambodia, President of the Cambodian People's Party (CPP), and Member of Parliament (MP) for Kandal. Eh Phuthong - Chinese Cambodian professional kickboxer and former reality TV host. ↑ ៨,០ ៨,១ ៨,២ ៨,៣ China-Cambodia: More than just friends? This article incorporates public domain material from websites or documents of the បណ្ណាល័យសិក្សាប្រទេសសមាជ.